Eat the food you love and still keep healthy. It can be done! An exercise fitness diet doesn't have to mean only eating tasteless ultra healthy food. No wonder all those so called "wonder diets" are only a fashion. They come and go just as quickly as this year's summer trends. Then why is it so hard to lose weight?! Or keep it to a level you're happy with? This is something that has bothered me, and still does on occasion! Click here if you've ever asked yourself - am I the ideal weight for my height? The fact is there is no answer that says do this and it will work. And that's because we're all different. Yes I'm stating the obvious, but it baffles me how often my friends see an exercise fitness diet that works for someone else and jump on the bandwagon. You are unique, your exercise fitness diet should be unique to you. It really can be this simple. It just takes some motivation on your part. And to be fair the fact that a healthy diet is proven to reduce the risk of so many diseases, should be motivation alone! A balanced exercise fitness diet includes all the food groups which will provide you with the nutrients to keep your body happy. But also the food you love that will keep you happy. It's a matter of finding the balance. Your food diary will guide you through that whole process. Most people find that they need to eat more complex carbs and fibre. These aren't in the fast foods that are so fiercely marketed, and so often are forgotten about. Click here for advice on eating more carbs and fibre. Note: Junk food is addictive and will cause your body to crave more junk food. This is usually caused by the high amounts of fat, sugar and salt. If you want to keep a small amount of junk food in your exercise fitness diet, then be wary that it will take even more motivation to keep a balanced diet. ...Keep a balanced, healthy diet within a team. It's hard doing anything on your own. It's even harder trying to eat well, when people around you don't understand. But if you're part of a team that shares your goals, that struggling motivation is given a huge boost. So keep yourself and others motivated. Try losing weight as a team, and of course live a lifestyle you enjoy in the process. This leads me to nutrition. Even the most balanced exercise fitness diet may not provide us with all the nutrients that our body needs. I know it's a drag - population vs. quality soil. It seems the ever growing population is winning that battle! 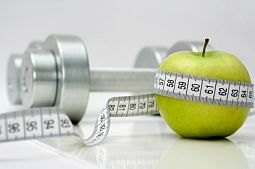 Click here for your exercise fitness nutrition guide. Find facts and advice on vitamins, minerals and supplements. You may want to take food supplements with your diet. These will top up all the vitamins and minerals that you may be lacking. They are in no way a substitute for food. The bulk of nutrients comes from the food in your diet. Another option is to actually study nutrition science which gives you a solid foundation for your diet planning. A top accredited online school provides such programs. Click here for more water advice. Water is the most important single factor in your diet. Keeping hydrated is a way of life. For me it is all about taking sips throughout the day. Keep a bottle of water next to you, whether you're working, exercising or resting. Take a sip every time the bottle catches your eye. Or in-between exercises. Talking of drinking, what about alcohol? How much do you drink, and is it too much? Also, the problem of teenage binge drinking - what are the solutions? 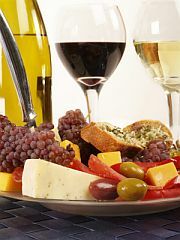 Alcohol risks - find the answers here. Want to give up smoking? Overcome your fears here. Your exercise fitness diet should be a way of life. Your way of life. Find that balance between all the food groups and your food loves. Compliment that with your exercises and I think you're on to a winner. Personally, I love Mediterranean food and their way of life. These Mediterranean recipes are so healthy and taste great. Some of my favourite places are in Spain, France, Italy and Cyprus. It's always their food that draws me back. Your balanced diet is as unique as you are. Discover it! Want to see your kids eating healthier and excited about it? These healthy recipes for kids (and the whole family) and ideas to get kids excited about cooking and eating healthy can help.